PINK1 is a master regulator of mitochondrial quality control that is directly linked to certain forms of Parkinson’s Disease. Patients who are homozygous for mutant forms of PINK1 or PINK1-pathway members Parkin or Fbxo7 develop early onset Parkinson’s Disease. What makes PINK1 so unusual? For one thing, it’s unstable and inactive under most conditions; it only becomes catalytically active in the presence of a depolarized mitochondrion. Second, it is the only known kinase that can phosphorylNew ate ubiquitin, which it does to drive the degradation of various mitochondrial proteins and even whole mitochondria, depending on the extent of the depolarization. Mitokinin is focused on boosting the activity of this critical kinase, but only when its active. Mitokinin’s drugs do not interfere with PINK1’s endogenous regulation; rather, they make it work harder once it has achieved its active conformation. Lazarou, Michael, Danielle A. Sliter, Lesley A. Kane, Shireen A. Sarraf, Chunxin Wang, Jonathon L. Burman, Dionisia P. Sideris, Adam I. Fogel, and Richard J. Youle. "The ubiquitin kinase PINK1 recruits autophagy receptors to induce mitophagy." Nature 524, no. 7565 (2015), 309-314. doi:10.1038/nature14893. Koyano, Fumika, Kei Okatsu, Hidetaka Kosako, Yasushi Tamura, Etsu Go, Mayumi Kimura, Yoko Kimura, et al. 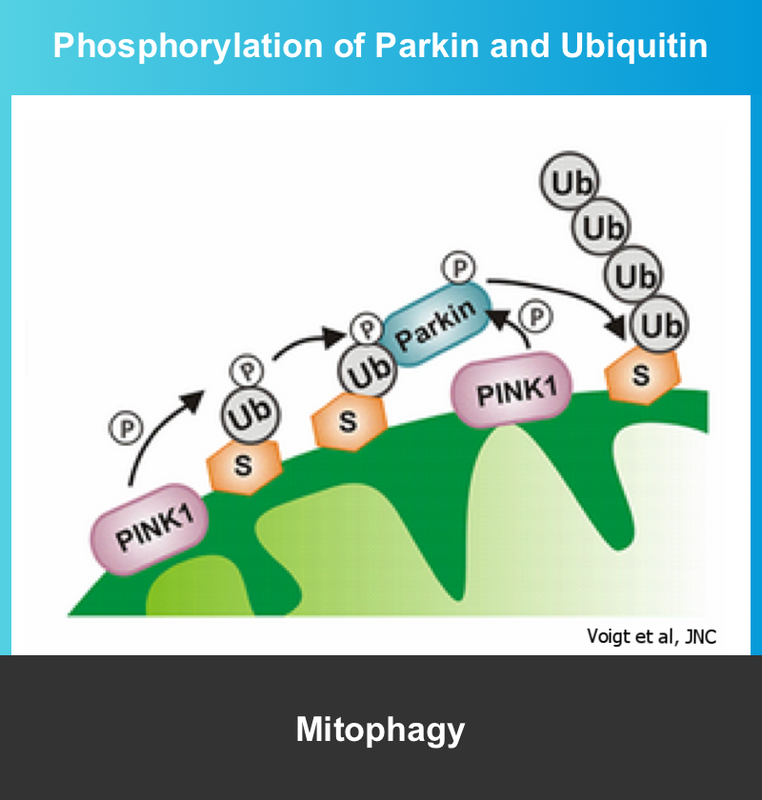 "Ubiquitin is phosphorylated by PINK1 to activate parkin." Nature, 2014. doi:10.1038/nature13392. Narendra, Derek P., Seok M. Jin, Atsushi Tanaka, Der-Fen Suen, Clement A. Gautier, Jie Shen, Mark R. Cookson, and Richard J. Youle. 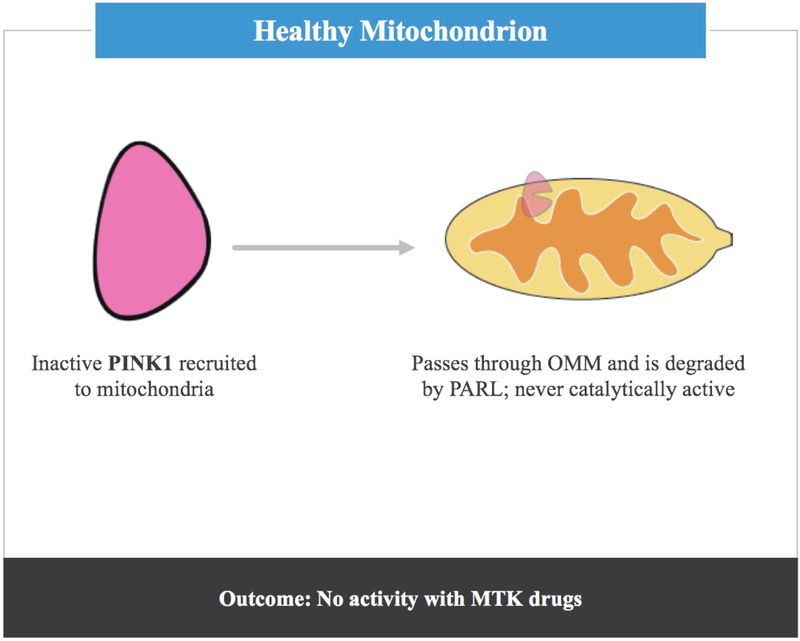 "PINK1 Is Selectively Stabilized on Impaired Mitochondria to Activate Parkin." PLoS Biology 8, no. 1 (2010), e1000298. doi:10.1371/journal.pbio.1000298. Lee, Yunjong, Daniel A. Stevens, Sung-Ung Kang, Haisong Jiang, Yun-Il Lee, Han S. Ko, Leslie A. Scarffe, et al. "PINK1 Primes Parkin-Mediated Ubiquitination of PARIS in Dopaminergic Neuronal Survival." Cell Reports 18, no. 4 (2017), 918-932. doi:10.1016/j.celrep.2016.12.090. Voigt, Aaron, Lena A. Berlemann, and Konstanze F. Winklhofer. "The mitochondrial kinase PINK1: functions beyond mitophagy." Journal of Neurochemistry 139 (2016), 232-239. doi:10.1111/jnc.13655. Hsieh, Chung-Han, Atossa Shaltouki, Ashley E. Gonzalez, Alexandre Bettencourt da Cruz, Lena F. Burbulla, Erica St. Lawrence, Birgitt Schüle, Dimitri Krainc, Theo D. Palmer, and Xinnan Wang. "Functional Impairment in Miro Degradation and Mitophagy Is a Shared Feature in Familial and Sporadic Parkinson’s Disease." Cell Stem Cell 19, no. 6 (2016), 709-724. doi:10.1016/j.stem.2016.08.002. Wang, Xinnan, Dominic Winter, Ghazaleh Ashrafi, Julia Schlehe, Yao Liang Wong, Dennis Selkoe, Sarah Rice, Judith Steen, Matthew J. LaVoie, and Thomas L. Schwarz. 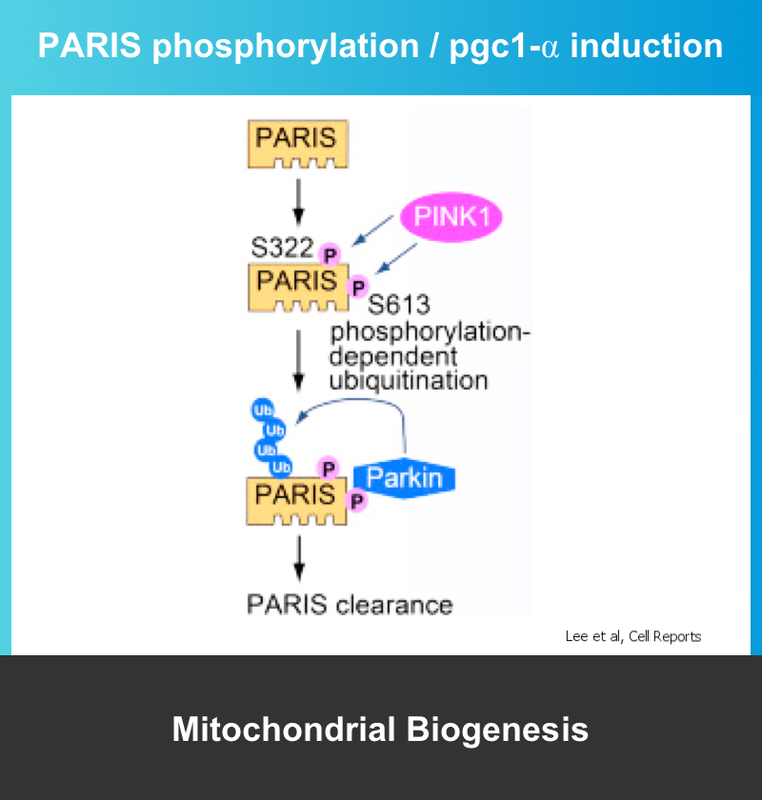 "PINK1 and Parkin Target Miro for Phosphorylation and Degradation to Arrest Mitochondrial Motility." Cell 147, no. 4 (2011), 893-906. doi:10.1016/j.cell.2011.10.018. Sorrentino, Vincenzo, Mario Romani, Laurent Mouchiroud, John S. Beck, Hongbo Zhang, Davide D’Amico, Norman Moullan, et al. "Enhancing mitochondrial proteostasis reduces amyloid-β proteotoxicity." Nature, 2017. doi:10.1038/nature25143. Du, Fang, Qing Yu, Shijun Yan, Gang Hu, Lih-Fen Lue, Douglas G. Walker, Long Wu, Shi F. Yan, Kim Tieu, and Shirley S. Yan. "PINK1 signalling rescues amyloid pathology and mitochondrial dysfunction in Alzheimer’s disease." Brain 140, no. 12 (2017), 3233-3251. doi:10.1093/brain/awx258. Choong, Chi-Jing, and Hideki Mochizuki. "Inappropriate trafficking of damaged mitochondria in Parkinson’s disease." Stem Cell Investigation 4 (2017), 17-17. doi:10.21037/sci.2017.02.07.